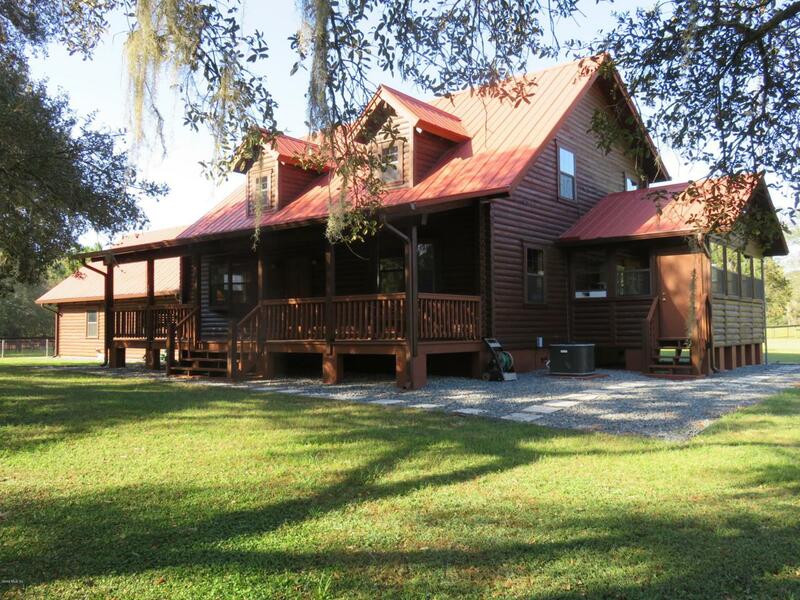 Country charm plus quality on 8 acres. 2 story log home with a long list of extras and upgrades (see paperclip). Fenced, rolling, well established pasture and plenty of large oaks for shade. 3/3/ home features new hardwood floors, authentic solid wood beams, covered front porch. Glass surrounds bonus room presently used as a formal dining room. Covered balcony off upstairs bedroom overlooks barn and property. Office niche off 2nd floor bedroom. Kitchen has all newer appliances, seamless custom corian counter tops, new tile flooring. Authentic log home was re-chinked & stained in 2016. New window glass in 2016. Enclosed lanai leads to a 2 car garage with full bath and extra room for workshop. Upstairs bonus area could be an apt or hobby room.4 stall center aisle barn w/tack room and feedstorage area. Round pen, 3 car covered carport. RV Hookup. A true value-must see to appreciate the ambiance!